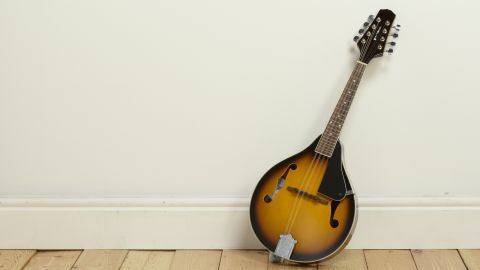 If you already know your way round a mandolin and are looking for a serious instrument then look elsewhere, bit if what you want is a reasonable entry-level instrument for an astoundingly cheap price, then this could be the instrument for you. Attractive finish, amazingly cheap and looks much more expensive than it is. Ropey intonation, poorly attached pick guard that buzzes. The adage: 'you get what you pay for' does not always ring true where musical instruments are concerned. After all, there are more quality instruments available at budget prices than ever before. Retailing at £59.99, the Gear4Music mandolin is certainly a budget instrument, but is it a quality one? First impressions are good and the mandolin is very attractive. The spruce top is finished in vintage sunburst; the subtle wood grain is visible from the centre, right out to just a few millimetres from the edge where three-ply plastic binding is tidily mounted. The vintage sunburst look continues on the sapele sides and rear of the body, and also up the mahogany neck and to the rear of the headstock. The front of the headstock is finished in opaque black. The neck binding is slightly less impressive than the body binding, but is adequate enough. The instrument has a beautiful high gloss finish, indicating a decent level of craftsmanship at Gear4Music. Only on the side of the headstock does the sunburst finish look a touch too busy, with lots of colour changes in a small area, but we really are splitting hairs. Aesthetically, then, this instrument is a winner. Only the contemporary looking Gear4music logo on the headstock interrupts the traditional look of the mandolin and alludes to its budget origins. Ignore the logo and you'd be forgiven for thinking this instrument was worth many times its actual price. As with many budget mandolins, the intonation on the Gear4Music instrument is a bit suspect when you get beyond the 7th fret. The dual-adjustable bridge really only alters the action and has little effect on the overall intonation. Still, the tuning is manageable for the most part, unless you're a more advanced player with a keen ear for pitch, in which case you'd be better off saving up for a more expensive instrument. With tuning issues sorted as far as possible, it's time to put the instrument through its paces. First up is Rod Stewart's Maggie May, followed by a set of Irish reels that hark back to a drunken youth. Melodic playing is definitely where Gear4Music's mandolin is at its best. The sound is bright, particularly on the treble strings, while the fourth string is a touch quieter and mellower. The mandolin has got plenty of volume to accompany other unamplified acoustic instruments and this is a really good sign. Spirited playing reveals an unfortunate flaw in the design of the instrument, though. Only two screws affix the essentially triangular pick guard to the body. Its third corner rests against a small block of rosewood, but remains unattached. As the mandolin resonates, the loose corner of the pick guard vibrates and creates a loud buzz. This can be easily fixed with drill and a screw, but it's a shame Gear4Music hasn't spotted the problem. If you don't fancy drilling into your new instrument, you can stop the buzz by pressing down on the pick guard with a spare pick-hand finger, but that's hardly ideal on an instrument that is intended to be flat picked. You may forgive the shortcomings of the Gear4Music mandolin when you take its exceptionally cheap price tag of £59.99 into consideration. If all you want is an instrument to lay down a few simple lines on your home recordings, this will suffice. Likewise, if you are a beginner who wants to try out the mandolin without parting with too much cash, this one certainly fits the bill. However, if you are a keen mandolin player looking for a high-end instrument, be realistic and remember, you get what you pay for.